Using transit in the Portland-Vancouver metro area just keeps getting easier with the Hop Fastpass™ electronic fare payment system. In addition to paying a fare with the tap of a Hop card, riders can now just tap their phone to pay. It’s the newest feature of Hop. All you need to use it is a smartphone and a mobile wallet app with a linked credit or debit card. Phone taps can be used to purchase adult fare only, but as with Hop cards, the fares are good for riding TriMet and C-TRAN buses, MAX Light Rail, WES Commuter Rail, C-TRAN’s Vine Rapid Transit and Portland Streetcar. Transfers between providers are seamless; riders need only to tap their phone against the target on the Hop reader each time they board. Paying by phone can save money too. Once a phone is tapped for two, distinct trips (more than 2 ½ hours apart) within the service day, the rider earns a day pass, and the rest of the day’s rides are free. Unlike Hop cards however, the same is not true on a monthly basis. To tap with a phone, you don’t need a Hop card; you just need a mobile wallet service like Android Pay, Apple Pay or Samsung Pay that is linked to a valid bankcard. Mobile wallet technology is safe, secure and private. Credit card account numbers are not actually stored on the phone. Instead, information is tokenized. That means unique identification symbols replace sensitive data; essential data is retained without compromising security. Mobile wallet apps are available for Android and Apple devices. Check out these websites to learn more. TriMet riders are required to provide proof of fare. Our fare inspectors have new equipment that allows them to scan a Hop card or phone to determine whether fare is valid. That’s one more reason to tap every time you board. A valid tap is your ticket to ride. If your phone is proof of payment, be sure to keep it handy and charged. Riders with Hop Fastpass™ accounts can still use their Hop card to enjoy all of the benefits that come with our new electronic fare payment system. Month passes can only be earned through Hop card taps. Registered account holders also get lost-card protection. If a card is lost or stolen, value can be frozen then transferred to a new card. Hop cards are now available at 120 retail outlets, including grocery and convenience stores, pharmacies and transit ticket offices, and we’re happy to offer fare-loading services at 7-Eleven stores throughout the greater Portland-Vancouver area. Once the retail network is fully built out by spring 2018, Hop cards will be available in more than 500 retail outlets. In addition to loading value in stores, riders can also manage their account at myhopcard.com, by downloading the Hop Fastpass™ mobile app or by calling 1-844-MYHOPCARD. 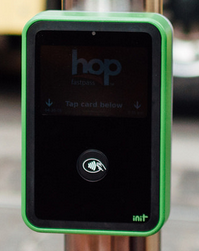 Hop brings transit fare payment across the Portland-Vancouver metro area into one easy system. And now, with the addition of the mobile wallet, it’s another simple way to pay. We are working continuously to improve the system, to expand Hop to regional employer transit programs and to broaden our network of Hop retail outlets. More to come in the future! TriMet has been working with systems partners since 2014 in the development of the $34 million Hop Fastpass™ system. It is expected to reduce fare evasion and reduce costs associated with ticket vending machines, cash purchases and collection processing. C-TRAN operates bus services within Clark County, Washington including the city of Vancouver. C-TRAN also provides express commuter service between Clark County and various points in Portland, OR, including downtown and other locations.